Thursday, 5th April 2012. The FBM KLCI moved lower after rallying to its historical high for the past two session this week. Other news to follow. "-U.S. stocks on Wednesday took their biggest hit in nearly a month on concern about Spain, where a weak bond sale revived investor concern about global growth. The Dow Jones Industrial Average DJIA -0.95% fell 124.8 points, or 1.%, to 13,074.7. The S&P 500 Index SPX -1.02% declined 14.42 points, or 1%, to 1,398.96, with financials hardest hit and telecommunications the best performing of the index’s 10 major sectors. The session marked the worst for both indexes since March 6. Capping its worst session of 2012, the Nasdaq Composite COMP -1.46% retreated 45.48 points, or 1.5%, to 3,068.09." "-Asian stocks fell Wednesday, with markets reacting to a surprise Australian trade deficit and its implications for the wider region, including China. Choppy trade for most Asian equities turned to solid losses after Australia said it ran a 480 million Australian dollar ($493 million) trade gap in February, compared to expectations for a A$1.1 billion surplus, according to a Dow Jones Newswires survey. After trading flat ahead of the Australian trade numbers, Japan’s Nikkei Stock Average JP:100000018 -2.29% tumbled to end 2.3% lower at 9,819.99. It marked the average’s biggest percentage drop since Nov. 1 and its first close below 10,000 since March 13. Australia’s own benchmark, the S&P/ASX 200 index AU:XJO -0.07% , fell 0.1%, while South Korea’s Kospi KR:0100 -1.50% lost 1.5%. Hong Kong and Shanghai markets were closed for a holiday, leading to reportedly lighter-than-usual volumes across much of the region. " "- Crude-oil prices on Wednesday ended at their lowest in seven weeks after a weekly government supplies report showed an increase nearly five times larger than expected. Crude oil for May delivery CLK2 +0.48% declined $2.54, or 2.4%, to $101.47 a barrel on the New York Mercantile Exchange. The drop follows a $1.22 loss in the previous session and marked the lowest price for a most-active crude contract since Feb. 14." "-May Soybeans finished up 2 3/4 at 1419 1/2, 10 1/4 off the high and 11 1/4 up from the low. May Soybean Oil finished up 0.12 at 56.02, 0.43 off the high and 0.32 up from the low. May soybeans shook off the bearish tilt to outside markets to close slightly higher on the session. More private projections for smaller South America crops and the "need" for soybeans to gain on most other crops in order to secure higher planted area that the March USDA planted acreage intentions has helped to provide underlying support. A bearish tilt to outside markets helped to pressure the market early today with a sharp drop in gold, crude oil and the stock market early plus a strong US dollar helped to spark selling pressures. Continued downgrades of the crops in Brazil and a firm tone to the corn market helped to turn the market higher and futures pushed sharply higher on the day into the mid-session. Taiwan is tendering for 40,000 to 60,000 tonnes of US or Brazil soybeans for May/June shipment." FKLI- Its Not A Hoax, Major Weakness Is Forming. Market will never stop to amaze us everyday as there is always something to learn, something new to experience such as new high and new low. No matter how well a computer or a software is design, it will never overtake the complexity of a human brain. This is why market is a psychological game rather than an intellectual game most of time. Traders who found them-self bound by certain knowledge or rules may not understand why market behave most of the time as well. A good example happen two days ago when the market break above its all time high above 1,600 level but that rally merely sustain and retraced yesterday. For beginner who learned to Long on break out will found themselves frustrating because it could a 30 points retracement from here but things can be different for those veterans to willing to risk at least 30 points when they Long at this break out. By leaving emotions at the doorsteps and minimize these psychological barrier, these veteran traders can decide and trade better as they know how to bend the rules. Points is you have to be flexible enough to see when the market is telling you it is evolving and forming different direction. Back to our FKLI market outlook, downside is limited due to positive sentiment on cash composite. Most of the blue chips counters are likely to support the market from falling steeply at the moment. Furthermore, our equity market is going to have a giant listing for FELDA this coming June. On technical perspective, things might be completely different, some correction is likely occur as traders prefer to be cautious due to evening star formation on daily chart. As shown by the chart above, this pattern is used by traders as an early indication that the uptrend is about to reverse. 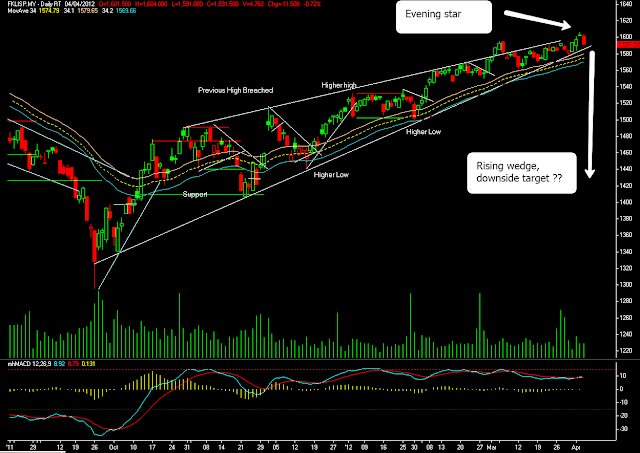 Market may fall steeply as the daily chart suggest that it is a big rising wedge formation formed so far. Unfortunately, the rising wedge can be one of the most difficult chart patterns to accurately recognize and trade. While it is a consolidation formation, the loss of upside momentum on each successive high gives the pattern its bearish bias plus negative divergence on MACD as well. However, the series of higher highs and higher lows keeps the trend inherently bullish. For this instances, the support trend line will act as a trigger point for Bearish momentum to kick in but traders are advised to wait for a lower high plus lower low for Bearish confirmation. For today, support is likely located around 1,582 while resistance is pegged at 1,600. FCPO- Some Mild Hurdles At The Top. CPO futures continue to hover resiliently on the top as most traders prefer to hold short term positions after the market was unable to sustain most of its gain on previous Monday this week. Although there is no major Bearish reversal pattern, Sellers are aggressively resisting the price from going up at the moment as market have closed lower from its opening price for the past two sessions. Yesterday, the benchmark June rise about RM24 to 3,557, the high and low of the day were 3,574 and 3,538 respectively. Technically, medium term upside momentum remain intact for the benchmark June and we are likely to expect more upside room if the benchmark June manage to breach above 3,580 this week. On the contrary, for short term we might expect some mild retracement currently due to profit taking activities after the market have surged about 3% on previous Friday. 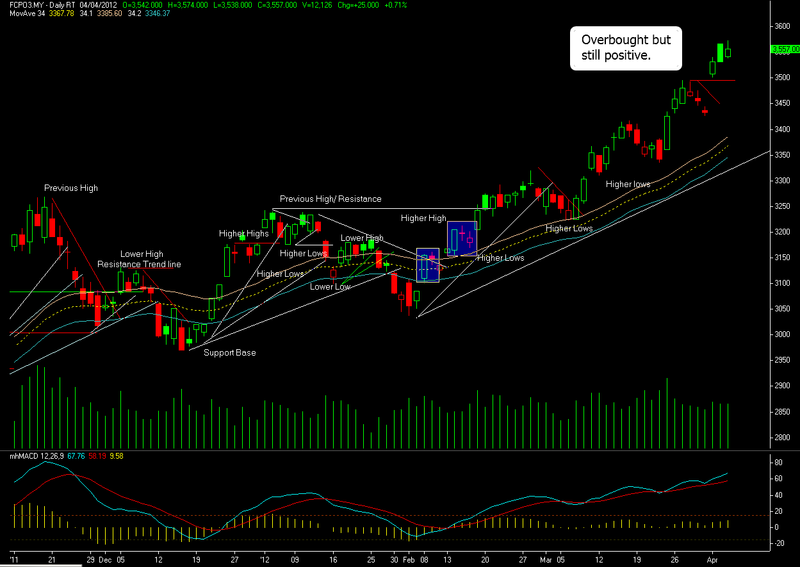 Hence, major support level is located around 3,500 if the market does retrace for profit taking. For today, support is located around 3,520 while resistance is pegged at 3,592~3,600 level.